Places to see in Sahibganj: The sightseeing places at Sahibganj truly offer a visual pleasure. 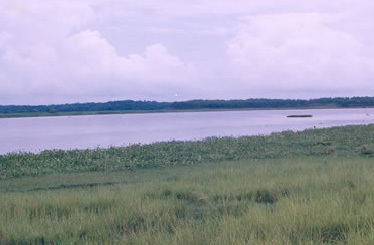 There is a natural twin lake at Sahebganj, called Udhwa Lake attracting tourists to savor its beauty. The lake is a safe refuge for different exotic species of birds. Moreover, migratory birds from as far as Siberia also visit the lake every year in huge number. You can also visit the Udhwa Bird Sanctuary, the sole bird sanctuary of Jharkhand nestled in the nearby village of Udhwa also known as Patauda. On your way to Sahebganj, you will find the beautiful ruins of Sangi Dalan built under the benefaction of Raja Maan Singh between 1580 and 1600 AD. The winding view of the River Ganga flowing next to this edifice offers a visual splendor. There is a historical well in Sahibgang, built in 1915, which is locally called ‘Bhagwa Kuan,’ constructed to commemorate the memory of Edward VII. You can also visit nearby Mandro to see the fossils of trees and animals. 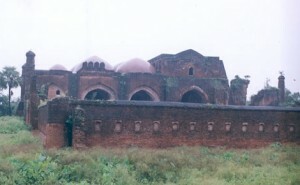 Akbari Masjid, Singhi Dalan, Tomb of Maina-Bibi and Tomb of Miran. Nearly 13 km north-west of Rajmahal town there is a serene village called Kanhaiyasthan, which owes its name to the shrine of Lord Krishna (Kanhaiya). It is said that Chaitanya Mahaprabhu on his way to Brindavan from Bengal stayed at this place and received the vision of Lord Krishna. 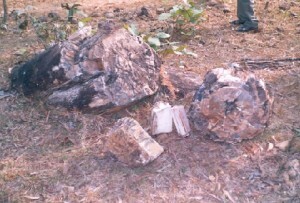 The impression of the step of Chaitanya Dev has been preserved at the site. You can also visit the ruins of Jama Masjid at Hadaf in Rajmahal, built under the reign of Raja Maan Singh in 1592 AD, which was once recognized as the most elegant building of Gaur (Bengal). In close proximity from the location, you will find Bara Darwaza, a unique fort located at the top of a hillock. The fort features 12 identical doors. The Archaeological Survey of India has declared the remaining of the fort as a heritage site. 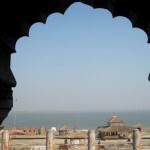 You will also find a number of temples in the neighboring areas of Sahebganj. The temple of Shiva in Barhait is truly adorable. 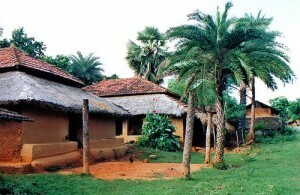 The place is frequented by disciples during the month of Shravan and the Mahashivratri. You will also admire the Binduvasini Temple near Barharwa railway station. Thousands of devotees assemble at the place during Ram-Navami when a grand fair is also held for nine days at the site. 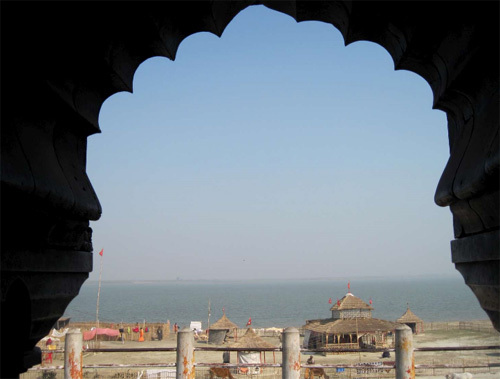 There is also a temple at Mirzapur village, known as Shukravasini Temple. Things to do in Sahibganj: Sightseeing is the major activity of the people visiting Sahibganj. Try to visit the mela held on every full moon of Magh month at Rahmahal. The mela is mainly dominated by the tribals gathering from all over the district. How to reach Sahibganj: Trains are available from Kolkata and Ranchi to Sahebganj. Best time to visit Sahibganj: You can visit Sahebganj any time of the year. Lodging and dining facilities in Sahibganj: Decent accommodation and dining facilities are available in nearby Malda which is around 2.5 hours drive from Sahibganj and Farakka, which is around 70 kms from Sahibganj (1 hr drive on NH 80).